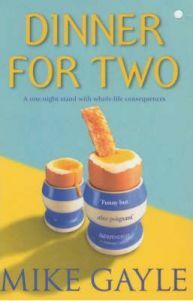 Dinner for Two tells the story of journalist Mike Harding and his wife Izzy. They both work in magazines and have busy successful careers so the last thing on either of their minds is about starting a family. That is until Izzy suddenly discovers that she is pregnant but then sadly loses the baby. This could either throw their relationship into turmoil or make their relationship stronger. What they do not bargain for though is Dave’s discovery that he actually already has a teenaged daughter as a result of a holiday fling when he was still just a teenager. As Dave starts to establish a relationship with Nicola (his daughter) it presents many difficulties for Izzy on many different levels. The reader does not know until the very end whether everything they go through is going to lead to the end of their relationship or a new beginning. If you want to find out, you will just have to read the book too! This is a fabulously told book and Mike Gayle is such a great storyteller. I like his male perspective and his fresh outlook on many things. I suspect that there is a lot of himself in the characters he creates. This has to be true in Dinner for Two when Dave loses his job and ends up becoming an agony uncle in a teen magazine. Apparently Gayle was once an agony uncle too so he is probably drawing on his own experience. The characters he creates in Dinner for Two are really believable and I like the way that we don’t get the usual stereotypical ideas. For example, it is Dave rather than Izzy who feels his biological clock ticking and it is he who feels desperate to become a dad. I think this makes Dave a really powerful character and one that you definitely want to know better. This is particularly true when he discovers the existence of Nicola and he experiences a whole range of emotions – the strongest of these being the love that he feels for the daughter he never knew. You really feel for Izzy too who, through no fault of her own, ends up in the middle of a situation she never asked for or expected. Dinner for Two has it all. It is a moving tale and I have to admit that there were one or two moments when reading that I found myself close to tears. However, at other times it is quite witty and I enjoyed reading about Dave’s reactions to ending up working for a teen magazine – quite a change from being a serious music journalist. Also, Dave is persuaded to write a ‘modern man’ column for Izzy’s women’s magazines and these very amusing pieces are presented in the form of emails that he send to her and cover a whole range of subjects from ‘the art of talking without talking’ to ‘women and the messages they leave on men’s answer phones!’ These are very entertaining and present some light hearted relief to the more serious storylines. I think Mike Gayle has got it absolutely right with Dinner for Two. With his light and easy style he manages to examine human emotions without trivialising them and he really enables the reader to engage with his characters. His short chapters make it easy to keep reading just that little bit more and before you know it you will have finished the book. The only disappointing thing about this book is the end! And that is only because you never want the end to come because it means that you will have to stop reading this wonderful book! No Comments on "Dinner for Two"